When I first venture into a new library I like to peruse the shelves and just get a feel for where everything is and what gems lie in wait for me. Recently I visited the Mary Jacobs Library in Rocky Hill, NJ. During my perambulations through their facilities I stumbled across the ten volume encyclopedia Man, Myth & Magic. 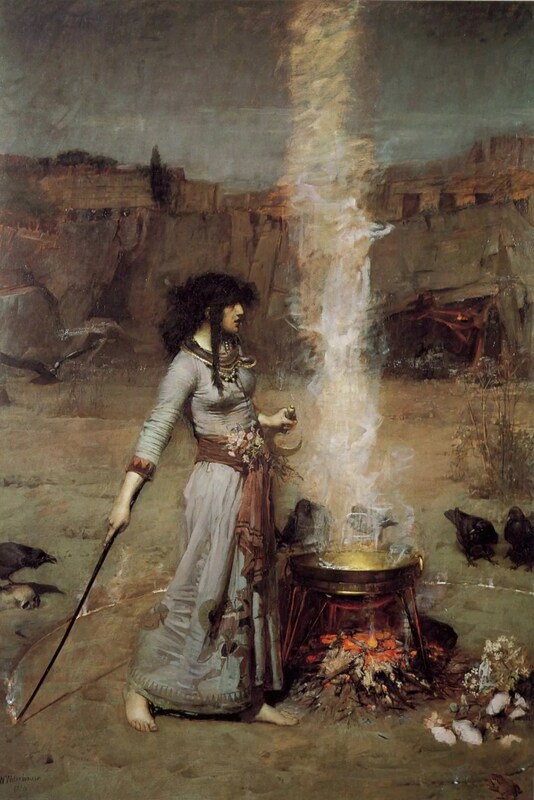 John William Waterhouse’s Magic Circle (Dec. 31, 1885). Originally published as a series of periodicals in 1970 it was compiled into an encyclopedia in 1983 and 1985 and had further revisions in 1995 and 1997. It is to this most recent edition I refer (unfortunately, there has not been any further updates to this series). I wasn’t sure what to expect, volumes of this sort tend to vary widely in quality. Some are reliable, academic works while others are unsubstantiated ramblings. This volume falls more in the former than latter. Roland H. Bainton – Professor of Ecclesiastical History (Yale); author. F.F. Bruce – Professor of Biblical Criticism and Exegesis (Manchester); author. William Sargant – physician in charge of the Department of Psychological Medicine, St. Thomas’ Hospital; author. M.C. Tenney – Professor of Theology (Wheaton); author. There are brief summaries regarding each author and editor in the book which I found delightful to read in and of themselves. E.M. Butler’s Ritual Magic (Cambridge University Press). Joan Evans’ Magical Jewels of the Middle Ages and the Renaissance, Particularly in England (Gale). C.G. Jung’s Psychology and Alchemy (Princeton University Press). J. Read’s Prelude to Chemistry: An outline of Alchemy (MIT Press). J.C. Baroja’s The World of Witches (University of Chicago Press). H.C. Lea’s Materials Towards a History of Witchcraft (AMS Press). Margaret A. Murray’s The God of the Witches (Oxford University Press). Montague Summers’ History of Witchcraft and Demonology (Routledge & Kegan Paul). H.R. Trevor-Roper’s The European Witch-Craze in the 16th and 17th Centuries (Peregrine). Paul Boyer and Stephen Nisssenbaum’s Salem Possessed: The Social Origins of Witchcraft (Harvard University Press). John Demos’ Entertaining Satan: Witchcraft and the Early Culture of New England (Oxford). R.E.L. Masters’ Eros and Evil: the Sexual Psychopathology of Witchcraft (Penguin). Aldous Huxley’s The Devils of Loudon (Harper & Row). St. Elmo Nauman’s Exorcism Through the Ages (Philosophical Library). Paul Carus’ History of the Devil and the Idea of Evil (Open Court). Richard Emmerson’s Antichrist in the Middle Ages (University of Washington Press). F.R. Johnson’s Witches & Demons in History and Folklore (Johnson N.C.). Jeffrey Russell’s Lucifer: the Devil in the Middle Ages (Cornell). Jeffrey Russell’s Satan: the Early Christian Tradition (Cornell). William Howard Woods’ History of the Devil (Putnam). Reginald Thompson’s The Devils and Evil Spirits of Babylonia (AMS Press). A.L. Herman’s The Problem of Evil and Indian Thought (Orient Bk. Dist.). Wendy O’Flaherty’s The Origins of Evil in Hindu Mythology (University of California Press). Richard Stivers’ Evil in Modern Myth and Ritual (University of Georgia Press). K. Amis’ New Maps of Hell (Arno). R. Cavendish’s Visions of Heaven & Hell (Harmony/Crown). Kaufman Kohler’s Heaven and Hell in Comparative Religion (Folcroft). Jacques Le Goff’s The Birth of Purgatory (Chicago University Press). John Macculluch’s The Harrowing of Hell: a Comparative Study of an Early Christian Doctrine (AMS Press). Bernard McGinn’s Visions of the End: Apocalyptic Traditions in the Middle Ages (Columbia University Press). James Mew’s Traditional Aspects of Hell (Gale). D.L. Sayers’ Hell, Purgatory (Penguin). H.B. Swete’s The Apocalypse in the Ancient Church (Macmillan). Daniel P. Walker’s Decline of Hell: Seventeenth Century Discussions of Eternal Torment (University of Chicago Press). David Aune’s Prophecy in Early Christianity and the Ancient Mediterranean World (Eerdmans). A. Guillaume’s Prophecy and Divination among the Hebrews and Semites (Harper & Row). E. Howe’s Astrology: The Story of its Role in World War II (Walker). Wilhelm Wulff’s Zodiac and the Swatsika: How Astrology Guided Hitler’s Germany (Arthur Barker). C.G. Jung and R. Wilhelm’s The Secret of the Golden Flower (Harcourt, Brace and World). Carl Jung’s Synchronicity: an Acausal Connecting Principle (Routledge & Kegan Paul). F. Altheim’s A History of Roman Religion (Dutton). Henri Frankfort’s Ancient Egyptian Religion (Harper & Row). W.K.C. Guthrie’s The Greeks and their Gods (Beacon Press). Georgia Pesek-Marous’ The Bull: A Religious and Secular History of Phallus Worship and Male Homosexuality (Tau Press). L. Spence’s Myths and Legends of Ancient Egypt (Harrap). George W. Cox’s Mythology of the Aryan Nations (Kennikat). E.A.W. Budge’s The Book of the Dead (Universal Books Company). J.G. Griffiths’ The Origins of Osiris (Argonaut). E.O. James’ The Cult of the Mother Goddess (Praeger). H. Licht’s Sexual Life in Ancient Greece (Greenwood). S.G.F. Brandon’s Creation Legends of the Ancient Near East (Verry). S. Langdon’s The Babylonian Epic of Creation (Clarendon Press). Joan O’Brien and Wilfred Major’s In the Beginning: Creation Myths from Ancient Mesopotamia, Israel, and Greece (Scholars Press). Edward Westermarck’s A Short History of Marriage (Humanities). Philippe Aries’ Western Attitudes Towards Death: from the Middle Ages to the Present (Johns Hopkins). S.G.F. Brandon’s The Judgment of the Dead (Scribner). John Hick’s Death and Eternal Life (Harper & Row). J.M. Clark’s The Dance of Death in the Middle Ages and the Renaissance (Jackson). L.P. Kurtz’s The Dance of Death and the Macabre Spirit in European Literature (Gordon Press). Peter Armour’s The Door of Purgatory: a Study of Multiple Symbolism in Dante’s Purgatorio (Oxford University Press). E.G. Gardner’s Dante and the Mystics: a Study of the Mystical Aspect of the Divina Commedia (Haskell). R.D. Gray’s Goethe the Alchemist (AMS Press). David Bindman’s William Blake: His Art and Times (Thames & Hudson). Ronald Grimes’ The Divine Imagination: William Blake’s Major Prophetic Visions (Scarecrow). Richard Carlisle’s (editor) The Illustrated Encyclopedia of Mankind (Marshall Cavendish). R. Cavendish’s King Arthur and the Grail: The Arthurian Legends and Their Meaning (Taplinger). Sabine Baring-Gould’s Curious Myths of the Middle Ages (Oxford University Press). K.M. Briggs’ An Encyclopedia of Faeries (Pantheon). Basil Cooper’s The Vampire: in Legend, Fact, and Art (Robert Hale). Basil Cooper’s The Werewolf: in Legend, Fact, and Art (Robert Hale). Paul Newman’s The Hill of the Dragon: an Enquiry into the Nature of Dragon Legends (Rowman). W.F. Albright’s Yahweh and the Gods of Creation (Eisenbrauns). Alexander Heidel’s Gilgamesh Epic and Old Testament Parallels (University of Chicago Press). Donald Leslie’s The Survival of the Chinese Jews (Humanities). James H. Lord’s The Jews in India and the Far East (Greenwood). D.S. Bailey’s The Sexual Relation in Christian Thought (Harper & Row). Lawrence Besserman’s The Legend of Job in the Middle Ages (Harvard University Press). James Gaffney’s Sin Reconsidered (Paulist Press). A.D. Nock’s Early Gentile Christianity and its Hellenistic Background (Harper & Row). J.A. Phillips’ Eve: The History of an Idea (Harper & Row). Norman Powell-Williams’ The Ideas of the Fall and of Original Sin (Longmans). Bruce Vawter’s Job and Jonah: Questioning the Hidden God (Paulist Press). I. Engnell’s Studies in Divine Kingship in the Ancient Near East (Allenson). Heinrich Dumoulin’s A History of Zen Buddhism (Pantheon Books). Mary Boyce’s (editor) Zoroastrianism (Barnes & Nobles Imports). M. Anesaki’s History of Japanese Religion (Tuttle). C.H. Gordon’s Ugaritic Literature (Argonaut). M.P. Nilsson’s History of Greek Religion (Greenwood). H.J. Rose’s Ancient Roman Relgiion (Hutchinson). T.C. Allen’s The Egyptian Book of the Dead (Chicago University Press). J.H. Breasted’s Development of Religion and Thought in Ancient Egypt (Peter Smith). E.A.W. Budge’s Egyptian Heaven and Hell (Open Court). J.C. Gibson’s Canaanite Myths & Legends (Attic Press). Brian Branston’s Gods and Heroes from Viking Mythology (Schocken). E.O. James’ The Ancient Gods (Putnam). Gilbert Murray’s A History of Ancient Greek Literature (Folcroft). Slater Brown’s The Heyday of Spiritualism (Hawthorn). C.E. Hansel’s ESP & Parapsychology: A Critical Re-evaluation (Prometheus Books). F. Pdomore’s Modern Spiritualism (E.J. Dingwall). Morton Kelsey’s God, Dreams and Revelation: a Christian Interpretation of Dreams (Augsburg). Leo Oppenheim’s The Interpretation of Dreams in the Ancient Near East (American Philosophical Society). F. Fordham’s An Introduction to Jung’s Psychology (Gannon). Erich Fromm’s The Greatness and Limitations of Freud’s Thought (Harper & Row). E.J. Dingwall’s (editor) Abnormal Hypnotic Phenomena: a Survey of Nineteenth Century Cases (Barnes & Noble). Stefan Zweig’s Mental Healers: Franz Anton Mesmer, Mary Baker Eddy, Sigmund Freud (Ungar). Shane Leslie’s St. Patrick’s Purgatory (Burns and Oates). J. Ancelet-Hustache’s Master Eckhart and the Rhineland Mystics (Harper & Row). Edmund Beaman’s Swedenborg and the New Age (AMS Press). Robert L. Moore’s (editor) Carl Jung and Christian Spirituality (Paulist Press). F. Neilson’s Teilhard de Chardin’s Vision of the Future (Revisionist Press). David Bakan’s Sigmund Freud and the Jewish Mystical Tradition (Schocken Books). Ernest Bates and J.V. Dittermore’s Mary Baker Eddy: The Truth and the Tradition (Halsted Press). Lawrence Foster’s Religion and Sexuality: Three American Communal Experiments of the Nineteenth Century (Oxford University Press). Handbook of the Oneida Community (AMS Press). H. Henson’s Oxford Group Movement. Tom Driberg’s The Mystery of Moral Re-Armament (Knopf). George R. Scott’s The History of Corporal Punishment: a Survey of Flagellation in its Historical, Anthropological and Sociological Aspects (Gale). George H. Williams’ The Radical Reformation (Westminster Press). Lynn Dumenil’s Freemasonry and American Culture, 1880-1930 (Princeton University Press). Aberdeen Witches – Witches in Scotland, what is myth, what is fact, executions. Agrippa – Involved in the occult. Ahriman – The evil god of Zoroastrianism. Aix-En-Provence Nuns – A group of nuns in the 17th century allegedly possessed by demons. Alchemy – Attempts to turn base metals into gold and to perfect the individual. Alexander the Great – The facts and the legend. Angels – From Jewish and Christian belief. Animals – All about their relationships with the spiritual – e.g., those that are sacred. St. Anthony – Experienced apparent demonic attacks. Aphrodite – Greek Goddess of love. Apollo – Greek god, the oracle at Delphi was his. Apple – It’s religious meaning goes far beyond Jewish/Christian thought. Arthur: The Once and Future King – You know, King Arthur. Asmodeus – A demon found in the book of Tobit. Astarte – Queen of Heaven, regularly led Jews away from Yahweh, also known as Ishtar and Aphrodite. Astrology – Predicting the future from the sky. Overall I was happy with the Encyclopedia, but let me note two areas of disgruntlement. The more minor involves the section on Astrology, which while decently long was still fairly confusing as far as how the system worked. I could have spent more time in it figuring it out, but I wasn’t that interested. The more major one is the tendency of some secular historians to recast religious beliefs from their own perspective. I can’t remember where, but at least once (it may have been in angels) I noticed a significant disconnect from what those who practice Christianity would say about a belief and how it was presented. This sort of playing loose and reinterpreting religious beliefs in a way that is outside what the practitioners of that religion would state as their belief is disconcerting. I don’t mind if it is done with a disclaimer and an explanation of how those within the religion would have viewed the matter, but when the external view is imposed without disclaimer it raises concerns for me – namely, how can I trust that you (the author) are providing me with a real account of other religions? If you cannot represent the beliefs of a major, well-known religion accurately, how do I know you have not misrepresented other, lesser-known religions? This is a major concern – but it is something found in so many books that I can’t write the volume off for this reason alone – I simply take the article with a grain of salt…kind of like Wikipedia. This trend seems to be most pronounced among scholarly authors (who, imho, sometimes get too big for their britches) but, thankfully, it appears to be a declining trend (from my subjective experience) – that is, academia seems more inclined to write objectively than it did for much of the 20th century when at least some authors felt the need to reinterpret instead of report.